Practising his First Aid bandaging technique reminds Huxley of mummies and ancient Egypt. He and Sam soon find themselves at a souvenir stall in modern day Egypt. 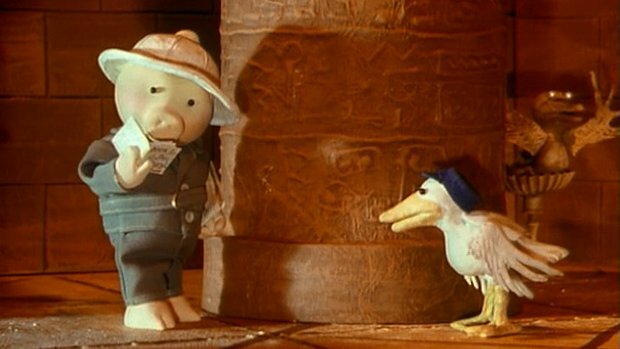 He and Sam soon find themselves at a souvenir stall in modern day Egypt run by Horace who cons them into buying the secret map to the undiscovered tomb and a guide book. Huxley and Sam set off....On their way they meet a snake charmer and Sydney the charming snake and later a fake fakir and Aziz the Artist, all of whom bare a remarkable resemblance to Horace. Eventually they reach the mummy's tomb where Horace tries to scare them but Sam gets even by dressing up as a mummy and scaring the wits out of Horace.